We gave 4 of our grandchildren new art supplies for Christmas. Each of them enjoys drawing and painting and I put together a set of NeocolorII watercolor crayons, Albrecht Durer watercolor pencils, a Pelikan opaque paint set, two waterbrushes, and drawing and painting sketchbooks. These all fit in a plastic Art Bin so they can keep all their own supplies together in their room. I spent several mornings with them making sure they knew how to use the sets. While they drew and painted, I sketched and painted with them and then forgot that I had these two pages in my sketchbook. 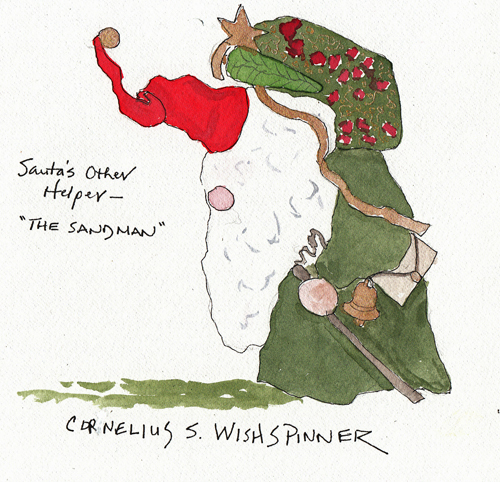 Cornelius Wishspinner: Cornelius is also known as the Sandman according to the legend that came with the pattern. This is a sculpture I made more than 30 years ago. It is about 8 " tall and is brought out every Christmas for our fireplace mantle. The clothes are all made of fabrics. He has a pack of toys on his shoulder and a leather pouch around his waste. 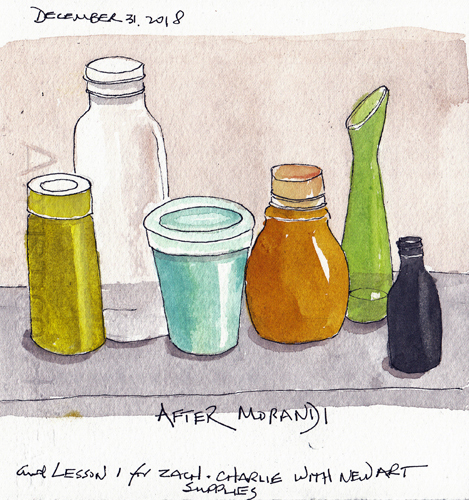 After artist Giorgio Morandi: I grabbed some jars and bottles from one of our dining room shelves and painted them, thinking about Morandi.